The triptych comes from the Middle Ages and was the preferred painting format for Christian church alters. The title of this piece, Trinity, was purposeful, but probably subconsciously connected to my Catholic past. In culinary terms, the trinity refers mainly to three standard ingredients from a chef's mis en place - celery, carrots and onions (which gives me an idea for another triptych painting) generally used at the start of many dishes. 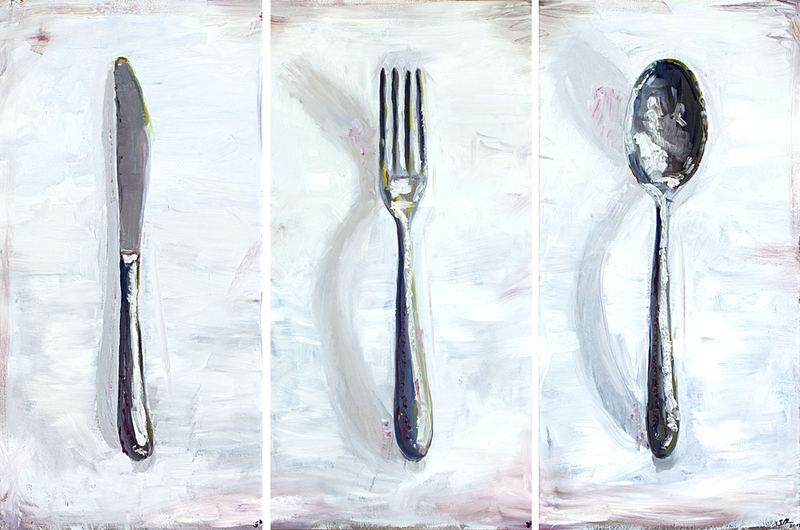 I simply chose the title Trinity for the power of threes – the knife-fork-spoon trio, the three canvas triptych, and the title of Trinity. While I agree that it could go way deeper than that, I'll leave that up to the art historians. What do you think? Trinity sold to a collector in Wyoming in June of 2013.